(without stand or speakers) 44.8" x 40.8" x 2.5"
The BeoVision 10 is the slimmest flat screen TV we have ever created, designed to hang on your wall with your other artwork. The design language of BeoVision 10 is candid and straightforward. A black glass square framed by a slender polished aluminium frame, which is angled and curved exactly right to give almost an optical illusion. The transition to the taut fabric of the loudspeaker cover is almost imperceptible. On the back, a concealed wall bracket lets you swing out the screen at an angle up to 45°– for viewing from a different location or getting out on the floor with family and friends to play today’s active video games. Flat on the wall, but big on sound: despite its ultra slim profile, BeoVision 10 stays loyal to the celebrated Bang & Olufsen tradition for great sounding televisions with high quality speakers and amplifiers built into the cabinet. We constructed the loudspeaker section with a custom-made bass port solution in the shape of a trumpet to eliminate any turbulent noise. 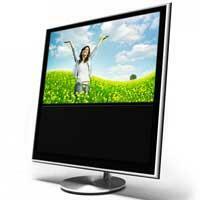 The latest LED backlight technology means that the screen is slimmer and uses less power than conventional LCDs. And you can be sure that all the motion on the screen is completely smooth thanks to advanced judder cancellation.